For the United States Navy sailor, see Timothy R. McVeigh. FBI mugshot of McVeigh in 1995. USP Terre Haute in Terre Haute, Indiana, U.S.
Timothy James McVeigh (April 23, 1968 – June 11, 2001) was an American domestic terrorist who perpetrated the 1995 Oklahoma City bombing, which killed 168 people and injured over 680 others. The bombing was the deadliest act of terrorism within the United States prior to the September 11 attacks, and remains the deadliest act of domestic terrorism in United States history. McVeigh was executed by lethal injection on June 11, 2001, at the Federal Correctional Complex in Terre Haute, Indiana. His execution was carried out in a considerably shorter time than most inmates awaiting the death penalty; most convicts on death row in the United States spend an average of fifteen years there. Terry Nichols and Michael Fortier were also convicted as conspirators in the plot. Nichols was sentenced to eight life terms for the deaths of eight federal agents, and to 161 life terms without parole by the state of Oklahoma for the deaths of the others. Fortier was sentenced to 12 years' imprisonment and has since been released. He was a top-scoring gunner with the 25mm cannon of the Bradley Fighting Vehicles used by his 1st Infantry Division and was eventually promoted to sergeant. He was stationed at Fort Riley, Kansas, before being deployed on Operation Desert Storm. In April 1993, McVeigh headed for a farm in Michigan where Terry Nichols lived. In between watching coverage of the Waco siege on TV, Nichols and his brother began teaching McVeigh how to make explosives out of readily available materials; specifically, they combined household chemicals in plastic jugs. The destruction of the Waco compound enraged McVeigh and convinced him that it was time to take action. Particularly, the government's use of CS gas on women and children angered McVeigh; he had been exposed to the gas as part of his military training and was familiar with its effects. The disappearance of certain evidence,  such as the bullet-riddled steel-reinforced front door to the complex, led him to suspect a cover-up. Those who betray or subvert the Constitution are guilty of sedition and/or treason, are domestic enemies and should and will be punished accordingly. Working at a lakeside campground near McVeigh's old Army post, he and Nichols constructed an ANNM explosive device mounted in the back of a rented Ryder truck. The bomb consisted of about 5,000 pounds (2,300 kg) of ammonium nitrate and nitromethane. To these people in Oklahoma who have lost a loved one, I'm sorry but it happens every day. You're not the first mother to lose a kid, or the first grandparent to lose a grandson or a granddaughter. It happens every day, somewhere in the world. I'm not going to go into that courtroom, curl into a fetal ball and cry just because the victims want me to do that. Shortly after the bombing, while driving on I-35 in Noble County, near Perry, Oklahoma, McVeigh was stopped by Oklahoma State Trooper Charles J. Hanger. Hanger had passed McVeigh's yellow 1977 Mercury Marquis and noticed that it had no license plate. McVeigh admitted to the state trooper (who noticed a bulge under his jacket) that he had a gun and McVeigh was subsequently arrested for having driven without plates and illegal firearm possession; McVeigh's concealed weapon permit was not legal in Oklahoma. McVeigh was wearing a T-shirt at that time with a picture of Abraham Lincoln and the motto: sic semper tyrannis ('Thus always to tyrants'), the supposed words shouted by John Wilkes Booth after he shot Lincoln. On the back, it had a tree with a picture of three blood droplets and the Thomas Jefferson quote, "The tree of liberty must be refreshed from time to time with the blood of patriots and tyrants." Three days later, while still in jail, McVeigh was identified as the subject of the nationwide manhunt. McVeigh was executed by lethal injection at 7:14 a.m. on June 11, 2001, at the U.S. Federal Penitentiary in Terre Haute, Indiana, the first federal prisoner to be executed by the United States federal government since Victor Feguer was executed in Iowa on March 15, 1963. "Why? McVeigh told us at eloquent length, but our rulers and their media preferred to depict him as a sadistic, crazed monster ... who had done it for the kicks". In a 1,200-word essay  dated March 1998, from the federal maximum-security prison at Florence, Colorado, McVeigh claimed that the terrorist bombing was "morally equivalent" to U.S. military actions against Iraq and other foreign countries. The handwritten essay, submitted to and published by the alternative national news magazine Media Bypass, was distributed worldwide by the Associated Press on May 29, 1998. This was written in the midst of the 1998 Iraq disarmament crisis and a few months before Operation Desert Fox. The administration has said that Iraq has no right to stockpile chemical or biological weapons (" weapons of mass destruction") — mainly because they have used them in the past. Well, if that's the standard by which these matters are decided, then the U.S. is the nation that set the precedent. The U.S. has stockpiled these same weapons (and more) for over 40 years. The U.S. claims this was done for deterrent purposes during its " Cold War" with the Soviet Union. Why, then, it is invalid for Iraq to claim the same reason (deterrence) with respect to Iraq's (real) war with, and the continued threat of, its neighbor Iran? The administration claims that Iraq has used these weapons in the past. We've all seen the pictures that show a Kurdish woman and child frozen in death from the use of chemical weapons. But, have you ever seen those pictures juxtaposed next to pictures from Hiroshima or Nagasaki? I suggest that one study the histories of World War I, World War II and other "regional conflicts" that the U.S. has been involved in to familiarize themselves with the use of "weapons of mass destruction." Remember Dresden? How about Hanoi? Tripoli? Baghdad? What about the big ones — Hiroshima and Nagasaki? (At these two locations, the U.S. killed at least 150,000 non-combatants — mostly women and children — in the blink of an eye. Thousands more took hours, days, weeks or months to die). If Saddam is such a demon, and people are calling for war crimes charges and trials against him and his nation, why do we not hear the same cry for blood directed at those responsible for even greater amounts of "mass destruction" — like those responsible and involved in dropping bombs on the cities mentioned above? Hypocrisy when it comes to the death of children? In Oklahoma City, it was family convenience that explained the presence of a day-care center placed between street level and the law enforcement agencies which occupied the upper floors of the building. Yet, when discussion shifts to Iraq, any day-care center in a government building instantly becomes "a shield." Think about it. I find it ironic, to say the least, that one of the aircraft used to drop such a bomb on Iraq is dubbed "The Spirit of Oklahoma." This leads me to a final, and unspoken, moral hypocrisy regarding the use of weapons of mass destruction. When a U.S. plane or cruise missile is used to bring destruction to a foreign people, this nation rewards the bombers with applause and praise. What a convenient way to absolve these killers of any responsibility for the destruction they leave in their wake. Unfortunately, the morality of killing is not so superficial. The truth is, the use of a truck, a plane or a missile for the delivery of a weapon of mass destruction does not alter the nature of the act itself. These are weapons of mass destruction — and the method of delivery matters little to those on the receiving end of such weapons. McVeigh included photocopies of a famous Vietnam War-era picture showing terrified children fleeing napalm bombs, and of nuclear devastation in Japan. He said in a preface that the essay was intended to "provoke thought — and was not written with malevolent intent." In February 2004, the FBI announced it would review its investigation after learning that agents in the investigation of the Midwest Bank Robbers (an alleged Aryan-oriented gang) had turned up explosive caps of the same type that were used to trigger the Oklahoma City bomb. Agents expressed surprise that bombing investigators had not been provided information from the Midwest Bank Robbers investigation. McVeigh declined further delays and maintained until his death that he had acted alone in the bombing. ^ a b c d e f g h Russakoff, Dale; Kovaleski, Serge F. (July 2, 1995). "An Ordinary Boy's Extraordinary Rage". The Washington Post. p. A01. Archived from the original on 2011-02-27. Retrieved April 12, 2010. ^ a b Ottley, Ted. "Imitating Turner". Timothy McVeigh & Terry Nichols: Oklahoma Bombing. TruTv. Archived from the original on February 27, 2011. Retrieved April 10, 2010. ^ Shariat, Sheryll; Mallonee, Sue; Stephens-Stidham, Shelli (December 1998). "Oklahoma City Bombing Injuries" (PDF). Injury Prevention Service, Oklahoma State Department of Health. Archived (PDF) from the original on 2014-05-18. Retrieved 2014-08-09. ^ "McVeigh biographers share 'chilling' audiotapes: Authors Michel and Herbeck reflect on McVeigh, OKC anniversary". MSNBC. April 15, 2010. Archived from the original on 2011-01-19. Retrieved April 22, 2010. ^ a b "Timothy McVeigh dead". CNN. Archived from the original on 2016-01-01. Retrieved July 30, 2015. ^ a b "Timothy McVeigh: Convicted Oklahoma City Bomber". CNN. March 29, 2001. Archived from the original on March 1, 2010. Retrieved April 12, 2010. ^ "Ancestry of Tim McVeigh". Wargs.com. Archived from the original on 2010-12-02. Retrieved June 4, 2010. ^ "McVeigh author Dan Herbeck quizzed". BBC News. June 11, 2001. Archived from the original on 2009-04-25. Retrieved March 28, 2010. ^ "Inside McVeigh's mind". BBC News. June 11, 2001. Archived from the original on 2009-07-01. Retrieved March 28, 2010. 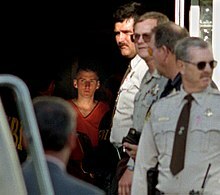 ^ a b "Profile: Timothy McVeigh". BBC News. May 11, 2001. Archived from the original on 2007-02-17. Retrieved March 28, 2010. ^ Chase, Alston (2004). A Mind for Murder: The Education of the Unabomber and the Origins of Modern Terrorism. W. W. Norton & Company. p. 370. ISBN 0-393-32556-3. ^ Smith, Brent L., Damhousse, Kelly R. and Roberts, Paxton, Pre-Incident Indicators of Terrorist Incidents: The Identification of Behavioral, Geographic and Temporal Patterns of Preparatory Conduct, Document No. : 214217, May 2006, p. 234, found at NCJRS Government website Archived 2008-03-12 at the Wayback Machine, Scribd website Archived 2016-03-06 at the Wayback Machine and DHS Government website. Retrieved July 22, 2009. ^ Linder, Douglas O. "The Oklahoma City Bombing & The Trial of Timothy McVeigh," Archived 2011-02-27 at WebCite, online posting, University of Missouri–Kansas City, Law School faculty projects, 2006, accessed August 7, 2006 feb 17; cf. People in the News: Timothy McVeigh: The Path to Death Row Archived 2007-03-13 at the Wayback Machine, transcript of program broadcast on CNN, June 9, 2001, 11:30 p.m. ET. ^ Russakoff, Dale; Kovaleski, Serge F. (July 2, 1995). "An Ordinary Boy's Extraordinary Rage". The Washington Post. p. A01. Archived from the original on 2011-02-27. Retrieved 2014-08-18. ^ a b Jacobs, Sally (June 10, 1995). "The Radicalization Of Timothy McVeigh". tulsaworld.com. Retrieved November 18, 2014. ^ a b Willman, David; Ostrow, Ronald J. (April 28, 1995). "Investigators Believe Bombing Was the Work of 4 or 5 People : Terrorism: Father, son are under scrutiny. FBI says 3 witnesses can place McVeigh near blast scene. Arizona town emerges as possible base for plotters". latimes.com. p. 4. Archived from the original on 2014-12-21. Retrieved 18 November 2014. ^ KIFNER, JOHN. "McVEIGH'S MIND: A special report. ;Oklahoma Bombing Suspect: Unraveling of a Frayed Life". New York Times. Archived from the original on 2016-12-18. Retrieved 9 January 2017. ^ "McVeigh 1st letter". CNN. Archived from the original on 2008-01-19. ^ a b Goldstein, Steve (May 3, 1995). "Mcveigh Wrote To Congressman About 'Self-defense'". philly.com. Archived from the original on 2016-03-04. Retrieved November 18, 2014. ^ Brian Morton (April 15, 2009). "The Guns of Spring". Baltimore City Paper. Times-Shamrock. Archived from the original on November 29, 2014. ^ Martinez, J. Michael (2012). Terrorist Attacks on American Soil: From the Civil War Era to the Present. Rowman & Littlefield Publishers. p. 289. ISBN 1-442-20324-2. ^ Handlin, Sam (2001) "Profile of a Mass Murderer: Who Is Timothy McVeigh? Archived 2007-10-14 at the Wayback Machine Court TV Online. ^ Thomas, Jo (November 14, 1997). "Jury Hears of McVeigh Remarks About Nichols and Bomb Making". The New York Times. Retrieved March 28, 2010. ^ a b Ottley, Ted. "Tim In Transit". Timothy McVeigh & Terry Nichols: Oklahoma Bombing. TruTv. Archived from the original on June 1, 2009. Retrieved April 12, 2010. ^ Bryce, Robert (August 18, 2000). "Prying Open the Case of the Missing Door". The Austin Chronicle. Archived from the original on 2014-02-25. Retrieved 2014-02-13. ^ Editors (2000) "Gun Shows in America." Archived 2007-09-14 at the Wayback Machine Violence Policy Center. ^ "Timothy McVeigh's Letter to Fox News". Digital-Exp.com. Archived from the original on August 23, 2001. Retrieved April 12, 2010. ^ "McVeigh Considered Assassinating Reno, Other Officials". Kuwait News Agency. April 27, 2001. Archived from the original on 2010-06-13. Retrieved April 12, 2010. ^ "McVeigh 'wanted to kill US attorney general'". The Daily Telegraph. London. April 28, 2001. Retrieved March 28, 2010. ^ Saulny, Susan (April 27, 2001). "McVeigh Says He Considered Killing Reno". The New York Times. Archived from the original on July 14, 2012. Retrieved March 28, 2010. ^ a b "Ready for execution, McVeigh says he's sorry for deaths". Newsok.com. June 9, 2001. Archived from the original on 2012-05-02. Retrieved May 25, 2012. ^ "Oklahoma City Bombing Injuries" (PDF). Oklahoma State Department of Health. December 1998. Archived (PDF) from the original on 2014-05-18. Retrieved 2014-08-09. ^ a b Vidal, Gore. Perpetual War for Perpetual Peace. pp. 1, 81. ^ Romano, Lois; Kenworthy, Tom (April 25, 1997). "Prosecutor Paints McVeigh As 'Twisted' U.S. Terrorist". The Washington Post. p. A01. Archived from the original on 2017-09-17. Retrieved 2017-09-16. ^ "McVeigh Vents On '60 Minutes'". cbsnews.com. March 13, 2000. Archived from the original on 2014-11-29. Retrieved November 18, 2014. ^ Thomas, Jo (March 29, 2001). "'No Sympathy' for Dead Children, McVeigh Says". The New York Times. Archived from the original on July 13, 2012. Retrieved March 28, 2010. ^ Collins, James; Patrick E. Cole; Elaine Shannon (April 27, 1997). "Oklahoma City: The Weight Of Evidence". Time. Archived from the original on 2010-06-15. Retrieved April 12, 2010. ^ Ottley, Ted. "License Tag Snag". Timothy McVeigh & Terry Nichols: Oklahoma Bombing. TruTv. Archived from the original on February 27, 2011. Retrieved April 12, 2010. ^ See "Officer of the Month – October 2001:[ permanent dead link] Second Lieutenant Charles J. Hanger, Oklahoma Highway Patrol," National Law Enforcement Officers Memorial Fund, copyright 2004–06. Retrieved August 8, 2006. ^ "The Timothy McVeigh Story: The Oklahoma Bomber". Crime Library. Archived from the original on February 27, 2011. Retrieved July 12, 2007. ^ "'Turner Diaries' introduced in McVeigh trial". CNN. Archived from the original on 2010-05-29. Retrieved May 25, 2010. ^ *Count 1 was "conspiracy to detonate a weapon of mass destruction" in violation of 18 USC § 2332a, culminating in the deaths of 168 people and destruction of the Alfred P. Murrah Federal Building in Oklahoma City, Oklahoma. Count 2 was "use of a weapon of mass destruction" in violation of 18 USC § 2332a (2)(a) & (b). Count 3 was "destruction by explosives resulting in death", in violation of 18 USC § 844(f)(2)(a) & (b). Counts 4 through 11 were first-degree murder in violation of 18 USC § 1111, 1114, & 2 and 28 CFR § 64.2(h), each count in connection to one of the eight law enforcement officers who were killed during the attack. ^ Romano, Lois (May 12, 1997). "Richard Matsch Has a Firm Grip on His Gavel in the Oklahoma City Bombing Trial". National Special Report: Oklahoma Bombing Trial. Washington Post. Archived from the original on 2010-10-30. Retrieved April 15, 2010. ^ "People In The News". CNN. February 7, 2001. Archived from the original on 2010-04-23. Retrieved May 25, 2010. Although 168 people, including 19 children, were killed in the April 19, 1995, bombing, murder charges were brought against McVeigh for only the eight federal agents who were on duty when the bomb destroyed much of the Murrah Building. Along with the eight counts of murder, McVeigh was charged with conspiracy to use a weapon of mass destruction, using a weapon of mass destruction and destroying a federal building. Oklahoma City District Attorney Bob Macy said he would file state charges in the other 160 murders after McVeigh's co-defendant, Terry Nichols, was tried. ^ See "Sentenced to Die," Archived 2013-02-18 at the Wayback Machine The News Hour with Jim Lehrer, Online NewsHour Archived 2014-01-19 at the Wayback Machine, PBS, June 13, 1997. Retrieved August 8, 2006. ^ People in the News: Timothy McVeigh: The Path to Death Row Archived 2007-03-13 at the Wayback Machine, transcript of program broadcast on CNN, June 9, 2001, 11:30 p.m. ET. ^ Serrano, Richard A. (August 15, 1997). "McVeigh Speaks Out, Receives Death Sentence". latimes.com. Archived from the original on 2014-12-21. Retrieved November 18, 2014. ^ " Timothy James McVeigh Archived 2011-06-29 at the Wayback Machine." Federal Bureau of Prisons. Retrieved May 19, 2010. ^ Williams, Dave (April 5, 2001). "Internet firm sues to broadcast McVeigh execution". CNN. Archived from the original on October 10, 2009. Retrieved April 12, 2010. ^ a b Mieszkowski, Katharine; Standen, Amy (19 April 2001). "The execution will not be webcast". Salon. Retrieved July 28, 2011. ^ a b Borger, Julian (June 11, 2001). "McVeigh faces day of reckoning". The Guardian. London. Archived from the original on 2013-08-25. Retrieved May 25, 2010. ^ McVeigh, Tracey (May 9, 2001). "Dead man talking". The Guardian. London. Archived from the original on 2013-08-25. Retrieved March 28, 2010. ^ Huppke, Rex W. " EXECUTION: Terre Haute, Ind. dreads execution of Timothy McVeigh." Associated Press at the Southeast Missourian. Friday April 6, 2001. 2A (continued from 1A). Retrieved from Google News (2/16) on October 14, 2010. "The planning for this day began when McVeigh was moved to the U.S. Penitentiary in Terre Haute, Indiana along with the 19 other federal death row inmates in 1999[...]"
^ a b "Bush calls McVeigh execution delay necessary". CNN. May 11, 2001. Archived from the original on June 14, 2010. Retrieved April 12, 2010. ^ " Federal Execution date set for Timothy James McVeigh Archived 2010-05-27 at the Wayback Machine." Federal Bureau of Prisons. January 16, 2001. Retrieved May 29, 2010. ^ Borger, Julian (March 30, 2001). "McVeigh brushes aside deaths". The Guardian. London. Archived from the original on 2013-08-25. Retrieved May 25, 2010. ^ "index". Lastmealsproject.com. Archived from the original on 2014-08-21. Retrieved 2014-08-18. ^ Quayle, Catherine (June 11, 2001). "Execution of an American Terrorist". Court TV. Archived from the original on 2012-11-10. Retrieved 2011-08-24. ^ Cosby, Rita (June 12, 2001). "Timothy McVeigh Put to Death for Oklahoma City Bombings". FOX News. Archived from the original on 2008-04-13. Retrieved April 15, 2008. ^ Ottley, Ted (June 7, 2001). "Pre-Execution News: McVeigh's Stay Request Denied". Timothy McVeigh & Terry Nichols: Oklahoma Bombing. TruTv. Archived from the original on March 18, 2011. Retrieved April 12, 2010. ^ Gottman, Andrew J (Spring 1999). "Fair notice, even for terrorists: Timothy McVeigh and a new standard for the ex post facto clause". Washington and Lee Law Review. Archived from the original on 2009-10-01. Retrieved April 12, 2010. ^ "Bill Summary & Status, 105th Congress (1997–98), S.923". Library of Congress. Archived from the original on 2012-12-17. Retrieved October 24, 2010. ^ "Hearing on S. 923 and H.R. 2040, to deny burial in a federally funded cemetery and other benefits to veterans convicted of certain capital crimes". U.S. House of Representatives. July 9, 1997. Archived from the original on 2010-11-03. Retrieved October 24, 2010. ^ a b Profile of Timothy McVeigh, Archived 2006-02-09 at the Wayback Machine CNN, March 29, 2001. Retrieved February 22, 2015. ^ McFadden, Robert D. (April 23, 1995). "Terror in Oklahoma: The Suspect; One Man's Complex Path to Extremism". The New York Times. Archived from the original on 2013-05-16. Retrieved March 23, 2011. ^ "Fellow inmate counsels McVeigh". USA Today. Associated Press. June 20, 2001. Archived from the original on 2003-06-10. Retrieved March 23, 2011. ^ " The McVeigh Tapes Archived 2010-12-04 at the Wayback Machine" Rachel Maddow Show, aired April 19, 2010, pt. 1 at 2 min. 40 sec. ^ Julian Borger, "McVeigh faces day of reckoning: Special report: Timothy McVeigh," Archived 2016-12-01 at the Wayback Machine, The Guardian Online, June 11, 2001. Retrieved October 19, 2010. ^ "Beliefnet.com". Archived from the original on 2014-12-05. Retrieved 2014-12-01. ^ "Indcatholicnews". Archived from the original on 2014-12-04. Retrieved 2014-12-01. ^ "Toledoblade". Archived from the original on 2014-12-25. Retrieved 2014-12-01. ^ McVeigh took last rites before execution Edition.cnn Archived 2015-11-27 at the Wayback Machine, CNN, April 10, 2001. Retrieved 7 October 2015. ^ "culteducation.com". Archived from the original on 2017-04-27. Retrieved 2017-04-26. ^ See "McVeigh Remorseless About Bombing," newswire release, Associated Press, March 29, 2001. ^ "Timothy McVeigh in Waco". UMKC.edu. Archived from the original on 2012-10-07. Retrieved August 14, 2012. ^ Michel and Herbeck; cf. Walsh. ^ McVeigh, Timothy J. (June 1998). "An Essay on Hypocrisy". Media Bypass magazine. Archived from the original on 1999-04-29. Retrieved September 4, 2018. ^ "McVeigh's Apr. 26 Letter to Fox News". Fox News. April 26, 2001. Archived from the original on 2011-02-27. Retrieved April 12, 2010. ^ "Terry Nichols Sentenced to Life With No Hope of Parole - The Tech". tech.mit.edu. Archived from the original on 2016-01-29. Retrieved 2016-01-23. ^ Neiwert, David. "The mystery of John Doe No. 2". Salon. Archived from the original on 2016-01-29. Retrieved 2016-01-23. ^ Achenbach, Joel (1995-06-11). "DEAD ENDS". The Washington Post. ISSN 0190-8286. Archived from the original on 2016-01-31. Retrieved 2016-01-23. ^ "Oklahoma City bomber Terry Nichols says in prison letters he is not a terrorist". MLive.com. Archived from the original on 2016-01-30. Retrieved 2016-01-23. ^ Thomas, Jo (April 30, 1996). "For First Time, Woman Says McVeigh Told of Bomb Plan". The New York Times. Archived from the original on February 27, 2011. ^ "Transcripts". CNN. January 20, 2006. Archived from the original on March 18, 2011. ^ "12-Year Sentence Given Again to Witness in Oklahoma Bombing". The New York Times. October 9, 1999. Archived from the original on March 18, 2011. ^ Hamilton, Arnold (January 18, 2006). "New life, identity await Fortier as he leaves prison". The Dallas Morning News. HighBeam Research. ^ Isikoff, Michael (2012-04-18). "Oklahoma City Bombing's Unanswered Questions in New Book". The Daily Beast. Archived from the original on 2016-01-14. Retrieved 2016-01-23. ^ "The Complicated Defense of Timothy McVeigh". Mother Jones. Archived from the original on 2016-01-30. Retrieved 2016-01-23. ^ "FBI | Cover Story". stories.fbi.gov. Archived from the original on 2016-01-29. Retrieved 2016-01-23. ^ Cross, Phil. "Did John Doe #2 exist? New book claims to solve decades-old mystery". KOKH. Archived from the original on 2018-07-22. Retrieved 2018-07-22. Jones, Stephen and Peter Israel. Others Unknown: Timothy McVeigh and the Oklahoma City Bombing Conspiracy, 2nd ed. New York: PublicAffairs, 2001. ISBN 1-58648-098-7. Michel, Lou and Dan Herbeck. American Terrorist: Timothy McVeigh and the Oklahoma City Bombing. New York: ReganBooks (HarperCollins), 2001. ISBN 0-06-039407-2. Brandon M. Stickney, "All-American Monster: The Unauthorized Biography of Timothy McVeigh". Amherst, New York: Prometheus Books, 1996. ISBN 978-1-57392-088-9. Vidal, Gore. Perpetual War for Perpetual Peace: How We Got to Be So Hated, Thunder's Mouth Press/Nation Books, 2002. ISBN 1-56025-405-X. 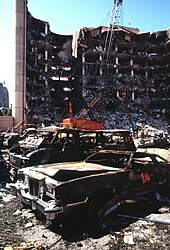 Wikimedia Commons has media related to Timothy McVeigh. Voices of Oklahoma interview with Stephen Jones. First person interview conducted on January 27, 2010, with Stephen Jones, lawyer for Timothy McVeigh.